You might not like it, you might not know it, you might be asking yourself 'eh? ', or you might be thinking 'I won't read this one, where's the stuff about Made In Chelsea? 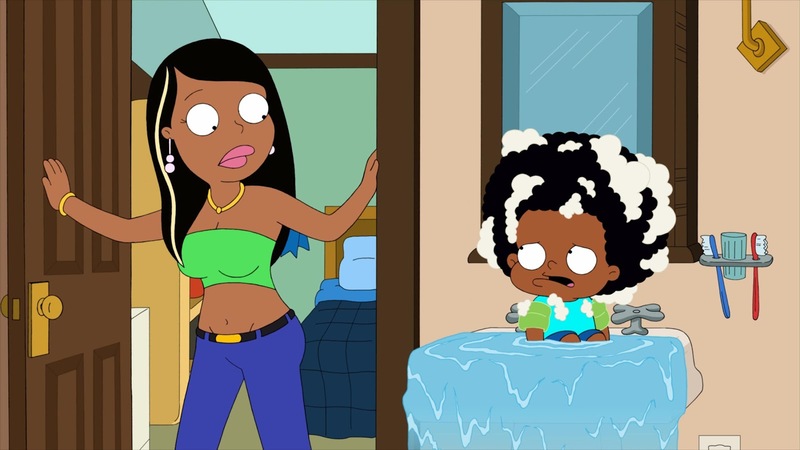 ', but no matter, because this post is about The Cleveland Show, an animated sitcom 'for adults', and a hitherto neglected show on tv-ooh's Freeview radar. That's a notional radar by the way. 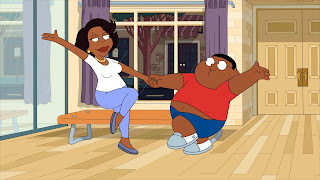 The Cleveland Show, a spin off from Family Guy about an uncomplicated family man called Cleveland Brown who reunites with his first love Donna and becomes part of her family in the fictional Virginia town of Stoolbend, is currently trundling through its second season on E4 (Tuesdays at 10, schedule seekers). In the US a fourth season has just been commissioned, which means, if nothing else, someone at the Fox network quite likes it - or at least wants to keep the show's creator Seth MacFarlane (who also runs Family Guy and American Dad!) close to hand, possibly so he can make more off-colour jokes about paedophiles in Family Guy, possibly not. 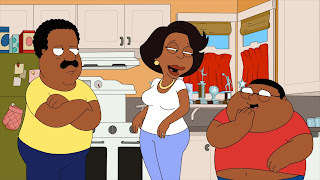 Cleveland's sitcom adventures aren't quite as grotesque as Family Guy, but have a sharper and sometimes cruder edge than The Simpsons - The Cleveland Show both knowingly mocks and imitates its most obvious inspiration: cosy family sitcoms like The Cosby Show about African American families full of smart quips and a self-contained 'dilemma of the week' that's all resolved at the end. Self aware and with a strong sense of the nonsensical and bizarre (one of Cleveland's friends is Tim the Bear - he is a bear), it's the main character's likeable nature which means there's something approaching warmth and heart in the show - but a biting comment is never too far away, like Cleveland angrily telling his wife he'll dance on her grave when he sulks about her replacing him with his son Cleveland Jr in a dance competition: "I'm going to enter that competition and win and my new dancing partner and I will dance on your grave.... oh I went too far, sorry about that." Later Cleveland Jr asks his father to leave the family home, having fallen in love with his step mother. Only after Cleveland rents a bachelor pad and buys new furniture for it does he realise his son can't talk to him like that, and returns to sort it out. Or perhaps you have to see it for yourself. Either way, The Cleveland Show is currently tv-ooh's favourite US animated sitcom on at 10pm on a Tuesday evening.